Without water human beings can’t exist. Throughout large parts of the world, people are facing water shortages. Recent United Nations’ data shows that significant water shortages commonly occur close to the equator. High temperatures and large amounts of sunshine only increase water constraints. At the same time, large amounts of sunshine have hidden benefits. Solar radiation can be used to power plants that generate fresh water. Water difficulties are not limited to the Middle East and Northern Africa. A recent report highlights the water difficulties of China’s large power utilities. The growth of fracking in China will only put more pressure on the nation’s precious water supplies. Powering more of the nation with solar energy would be an effective way for the government to decrease China’s water use. Innovating is easy when one of the world’s primary oil producers is ready to finance billion dollar projects. Desalination plants use large amounts of energy to create fresh water from sea water. The Saudi government has already announced the construction of three new solar-powered desalinization plants in the cities of Haqel, Dhuba and Farasan by 2018. Saudi Arabia is plowing ahead with their $109 billion energy revolution and Sunpower Corporation (NASDAQ:SPWR) is ready to help out. To prove the company’s products, it installed a two megawatt system in 2010 to power the King Abdullah University of Science and Technology. In the end the system’s true yield was 5.0% higher than that which was expected. With a growing Saudi population, many distributed power solar systems suffer from a lack of space. Sunpower’s high efficiency technology helps to reduce real estate requirements. Sunpower’s very efficient solar panels, strong warranty and backing by the French oil company Total are the company’s strong points. Its debt load is manageable with a total debt to equity ratio of 0.83. The company is expected to earn $0.66 per share in 2014, but these numbers are still estimates. With a profit margin of -14.6% the company does have some short term negatives. Regardless, long term investors who are willing to wait out the industry’s vicious cycles will find a good match in SunPower Corporation (NASDAQ:SPWR). First Solar, Inc. (NASDAQ:FSLR) is also involved with The King Abdullah University of Science and Technology in Thuwal, Saudi Arabia. Sunpower has a more prestigious involvement as its panels power the university, but First Solar did donate a 3.2 kilowatt system as a demonstration project. First Solar is quick to point out that their panels hold up better under high temperatures than the average multicrystalline silicon panel. Still, the company’s module efficiency road map shows that by 2017 its average efficiency of 17.2% will still be below Sunpower’s X-Series solar panels that currently offer 21.5% efficiency. First Solar’s thin film technology is cheaper than SunPower Corporation (NASDAQ:SPWR)’s, but higher efficiency cells decrease the total system cost by requiring less real estate. On the positive side, First Solar, Inc. (NASDAQ:FSLR) has almost no debt with a total debt to equity ratio of 0.16. 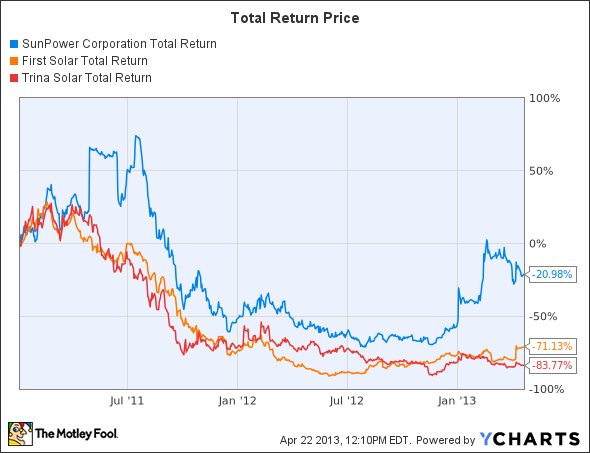 Its current profit margin of -2.9% places it much closer to profitability than Sunpower. In 2014 it is expected to earn around $3.39 per share. Still, Chinese companies are rushing ahead to win the cost war and First Solar’s future is still unclear.